Busted messaging: CFC's cause warming AND cooling | Watts Up With That? From the make up your freaking minds department comes this oopsy juxtaposition of alarmist messaging. Human actions that were not intended to limit the greenhouse effect have had large effects on slowing climate change. The two world wars, the Great Depression and a 1987 international treaty on ozone-depleting chemicals put a surprising dent in the rate at which the planet warmed, says research published today in Nature Geoscience1. Francisco Estrada, an ecological economist at the Free University in Amsterdam, and his colleagues analysed annual temperature data collected from 1850 to 2010, as well as trends in emissions of greenhouse gases such as carbon dioxide, methane and chlorofluorocarbons (CFCs) — ozone-depleting substances that also trap heat in the atmosphere — between 1880 and 2010. The warming of the climate system is unequivocal as evidenced by an increase in global temperatures by 0.8 °C over the past century. However, the attribution of the observed warming to human activities remains less clear, particularly because of the apparent slow-down in warming since the late 1990s. Here we analyse radiative forcing and temperature time series with state-of-the-art statistical methods to address this question without climate model simulations. We show that long-term trends in total radiative forcing and temperatures have largely been determined by atmospheric greenhouse gas concentrations, and modulated by other radiative factors. We identify a pronounced increase in the growth rates of both temperatures and radiative forcing around 1960, which marks the onset of sustained global warming. Our analyses also reveal a contribution of human interventions to two periods when global warming slowed down. Our statistical analysis suggests that the reduction in the emissions of ozone-depleting substances under the Montreal Protocol, as well as a reduction in methane emissions, contributed to the lower rate of warming since the 1990s. Furthermore, we identify a contribution from the two world wars and the Great Depression to the documented cooling in the mid-twentieth century, through lower carbon dioxide emissions. We conclude that reductions in greenhouse gas emissions are effective in slowing the rate of warming in the short term. I don’t think anybody really knows which way it is going. Actually, just trying to understand. For years I have hears that the efforts to close the antarctic ozone hole was causing that area to cool as well. So this should be no surprise to those on the ball. I can’t wait to read the paper. Yes they do – badly (for them). Hence their need for excuses. The BBC on the same subject, shows a graph which states “The recent slowdown in global warming is highlighted by the grey shading”. The three lines within the grey shading have trajectories which would closely follow that of a participant in the Red Bull Cliff Diving Championship. Frankly, until they can explain why the world goes into and out of ice ages AND then can show that what is going on now is unique, then, and only then, will I buy into man-made climate anything. Oh look! Bright, shiny new climate control knobs to play with on their dial- o-climate contraption. What’s to understand? The science is settled, right? The 97% consensus is unassailable & incontrovertible that humans are causing dangerous global warming, er climate change, er extreme weather, right? It is intuitively obvious that CFC’s contribute to cooling. Pop open a can of RF12 and you will freeze your fingers. QED. There is a simple answer for all this: Somehow, someway for every bad event that happens, we are at fault. So now surrender your rights and pay up. P.S. I, the enlightened telling you this, don’t have to pay and will still have full rights. When you remember that is how environmentalists think, then nothing is a contradiction. It’s a bit of a mess really. A few years back they blamed ozone for the increase in Antarctic sea ice extent. Then they blamed melting ice. Then wind and currents. Pot Puri science. A common view is that the current global warming rate will continue or accelerate. But we argue that rapid warming in recent decades has been driven mainly by non-CO2 greenhouse gases (GHGs), such as chlorofluorocarbons, CH4, and N2O, not by the products of fossil fuel burning, CO2 and aerosols, the positive and negative climate forcings of which are partially offsetting. The growth rate of non-CO2 GHGs has declined in the past decade. If sources of CH4 and O3 precursors were reduced in the future, the change in climate forcing by non-CO2 GHGs in the next 50 years could be near zero. Combined with a reduction of black carbon emissions and plausible success in slowing CO2 emissions, this reduction of non-CO2 GHGs could lead to a decline in the rate of global warming, reducing the danger of dramatic climate change…. Anthony, see my last reference. This is what you get when the inmates get to running the climate change mental asylum. Or as an old saying goes and this is ever more applicable to climate change science and scientists. “Some minds are like concrete. All mixed up and set hard”. It is about time climate scientists took a long walk on a short pier. What use are they in this world, would anyone miss them if they did not exist? So, let’s see: Estrada & co., are using statistical methods to find associations and then concluding physical causality. Right. Someone needs to explain to these guys how science works. State of the art climate models that cannot reproduce ordinary climate are nevertheless touted as able to detect unexpected and complex climate feedbacks. Truly bizarro-world. A better correlation is with the PDO. Every upward segment is a warm PDO and every downward segment is a cool PDO. I suspect this correlation whips the one they found. By the way Pippen Kool, how do you know the Ozone hole hasn’t always been there? The hole was discovered in 1985. Here are a few articles to cheer you up. Based on the abstract, this might be the funniest paper ever submitted. Can you imagine examining the methodology in that? And we thought slap-stick comedy was gone…. Does that mean we can bring back the CFCs? Every 500 years we go thru mini warm/cold climate phases in between big ones and we are in the peak of a mini warm age which the late 90s were it. Right now it’s trending downwards slowly so there will again be a lot of fluxing going on with global temps in various areas. The East Coast for the next 5-10 years will have a few very scary heatwaves until we lose the heating we gained in the 90s. Dad back in the 70s who studied these warm/cold cycles knew that it would warm up again in the 90s while everyone else either thought it would be an ice age. First the scam scientists thought by the 1990s there wouldn’t be enough food to go around then when they couldn’t blame that they blamed the O-zone then after that failed they came up with Global Warming then even after that failed they came up with *Climate Change* to get big money out of you’re tax dollars. If there is any other scandals I missed feel free to chime in! I hate how this article makes it look like I can make a name/email without logging in and I lost all of my article about the different scams these scientists have been doing to us for the last 60 years. If anything during WW1 and 2 factories would be at full power! Did you know there is a Tibet ozone hole? Your points are well taken, however CFCs have been around since the 1890s, although of course not in the masses of the 1960s. They were used in WWII. Clouds are now a cooling forcing? Or just the bright ones in cold places? How long will so-called scientists do time series analysis and call it science? Can they not read their own writing. Look at the phrase “time series analysis.” See that word ‘analysis’ in there. That should tip off everyone that the technique is not science. Time series analysis can be a wonderful thing when used by greatly experienced consultants in advising corporate planning on looming decisions. It can be very valuable. But it is not science. As in the case of models, predictions cannot be based on time series analysis. No predictions means no science. I will ask again, since I can’t seem to find anything on this research past this article date. What happened with this ? Unfortunately, this kind of curve fitting infests science. Combined with lack of publicly available data and computer code, the average person should just assume that *anything* a scientist says, regardless of what field they’re in, is just an attempt to get grant money. I’m not saying that’s all science is, but the situation is bad enough that this should be the default assumption. The panel had hoped to avoid more corrections after an embarrassing error about Himalayan ice-melt in its 2007 report. “Errors in the summary for policymakers were discovered by the authors of the report after its approval and acceptance by the IPCC,” it said in a statement. (Bob Ward): “Climate change ‘sceptics’ will no doubt desperately seize on these corrections and falsely allege that it undermines the whole report, but the public and policy-makers should not be fooled by such claims,” he said in a statement. Way to GO! I’m amazed at all these folks who assume that CFCs actually caused something they only discovered a short while ago, have no idea when it first occurred, or if it had been there since the dawn of time for all they knew, and THEN have the audacity to claim that their treaty to reduce CFCs is what’s responsible for it’s reduction in size, when they have yet to prove that’s the cause! I’m reminded of the Red Spot storm on Jupiter, in existence at least since man first saw the planet through a telescope. I’ve heard various explanations for it’s longevity, all related to fluid mechanics—i.e., wind effects. Given the circumpolar nature of wind and currents around the Antarctic, isn’t it a strong possibility that the ozone hole is an artifact of the weather, NOT CFCs? I’ve yet to hear a proven explanation of how CFCs managed to accumulate in sufficient quantities in the Southern Hemisphere to have such an effect, but truth to be told, I haven’t paid all that much attention to the arguments either way since the one side kept saying, “We need more research” (which seemed both obvious and worthless, since the only people getting research money are using it to try to prove that mankind is responsible for every natural occurrence with a dire outcome—searching for actual facts, whether they support your favorite pet conclusion or not, is just not in style, ever, it seems) and the other side kept repeating with increasing shrillness that it didn’t matter, because the answer, when found, would mean that MAN was responsible (except the enlightened few—of course! h/t to @axelwade! ), and it DOUBLY didn’t matter, because even if they were completely wrong, pauperizing the world’s economy and causing people to starve and die in developing nations would be worth it because we’d be saving the earth for posterity (of the rats and cockroaches, perhaps)—thank you, Tim Wirth, a ratbag of particular virulence, and if you love the Rainforests to much, buckwheat, why doncha trade your limo and condo to some poor farmer who only wants for his children what you take for granted, and YOU can live with malaria and pestilence and short life-expectancy while looking after your precious rainforest (which doesn’t need you) and he and his can enjoy the benefits of the modern world, and we’ll ALL be much happier! The most valid CAGW alarmist statement about the current State of Climate Research was made in Climategate 1.0, years ago…when Kevin Trenberth made his famous comment about travesty. His declaration, coupled with the scope of the disaster, moved many of the delegates to tears. Yet scientists remain cautious about drawing links between extreme storms like this typhoon and climate change. There is not enough data, they say, to draw conclusions about any single storm. Analysts say the likeliest outcome of the Warsaw negotiations is a weak pact that essentially urges countries to do what they can to cut emissions. I thought they didn’t believe there was a pause at all. The pause was just more skeptic mumbo jumbo. Now not only do they accept the pause, but they have already have a reason for it. Here in New Zealand our arrogant National Institute of Water and Atmospheric Research (NIWA) has been using dubious, unpublished methods to adjust the temperature record thereby showing warming of nearly 1 deg. C over the last century (http://www.niwa.co.nz/node/82418). As your graphic of the ozone hole shows, NZ is firmly underneath this hole (at about long. 180), so, yeah I agree make up your freaking minds. Here we analyse radiative forcing and temperature time series with state-of-the-art statistical methods to address this question without climate model simulations. I believe the standard operating procedure is now for Kevin Trenberth to have a hissy fit. To calm him down, the editor of the journal must resign while insisting that there isn’t actually anything wrong with the paper, but that climate modelers should have been consulted. Ozone is diamagnetic (repelled by a magnet), O2 is strongly paramagnetic (attracted by a magnet) so ozone is pushed away from the pole and O2 is attracted so there will always be an ozone hole. Note the “collar” of elevated ozone around the hole, like a roll neck sweater. What will they say when the hole expands again as it surely will. Also, since all the other gases are diamagnetic there should be a nitrogen hole, carbon dioxide hole, methane hole, and noble gases holes to go along with the ozone hole. A simple test: measure the concentration of atmospheric gases above the equatorial band and compare with above the south pole (the north pole air is subject to considerable mixing because of “weather”). 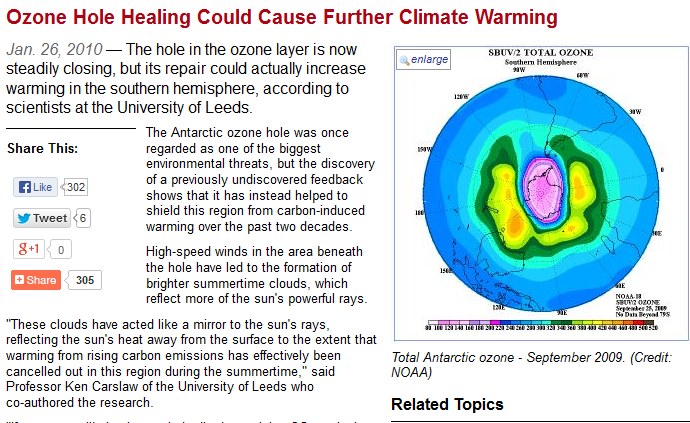 There never was a need for CFCs to explain the ozone (and all the other coincident) holes above the south polar area. Re last comment: If no one wants it, I guess we could call it the Pearse effect! The Sun is acting a little funny. Maybe that’s the real cause of the problem. At least as far back as the 2001 IPCC TAR there were pretty well established forcing numbers for various halocarbons. Probably in the FAR and SAR as well, but I don’t have copies of those to check. As far as climate effects of ozone depletion goes (a different issue than direct forcings from CFCs), the research I’ve seen has mostly focused on Antarctic temperatures. There are two distinct themes here that I want to separately analyze. First of all there is still an ozone hole in the Antarctic despite the Montreal Protocol that is touted as the most successful international agreement on the environment so far. In 2012 they had their twenty-fifth anniversary celebration during which they boasted that they have eliminated 98 percent of all the substances banned under the treaty. I hate to tell you guys, but the existence of the ozone hole today means that those substances were not the cause of the ozone hole in the first place and were banned for nothing. Your success in eliminating them tells me this. The Montreal Protocol is an environmental treaty based on false science and should be voided. Next, here is what your “new” paper ventures to say: “We show that long-term trends in total radiative forcing and temperatures have largely been determined by atmospheric greenhouse gas concentrations…” That is quite impossible because laws of physics do not permit it. We are talking here of greenhouse warming by addition of carbon dioxide to the atmosphere. Lets start by looking at temperature history from the beginning of the twentieth century. The first ten years of the century were actually cooling, not warming. Then, suddenly in 1910 warming started, kept on going for thirty years until 1940, and then equally suddenly stopped.We have good information on how the amount of atmospheric carbon dioxide changed over time, The Keeling curve starts in 1958 but earlier years are also well represented from an analysis of ice cores. From this we know that there was no change in atmospheric carbon dioxide in 1910 when the warming started. Why is this important? It tells us that this warming cannot possibly be greenhouse warming because in order to start a greenhouse warming you must simultaneously increase atmospheric carbon dioxide. And this did not happen. The reason for this requirement is that the IR absorbance of carbon dioxide is a property of the gas and cannot be changed. To start a warming you must add more gas molecules to air. And the way this warming ended also rules out the greenhouse effect because in order to put a stop to warming you would have to remove all the absorbing CO2 molecules from the air, an obvious impossibility. There are three other points in time where warming suddenly started and 1960 is not one of them. The first was the climb out of the deep World War II cold spell in the second part of the forties. The second was in 1976 when a short temperature increase raised global temperature by 0.2 degrees. It has been attributed to a phase change of PDO and is hence of oceanic origin. It was all over by 1980. And the last one was the step warming caused by the warm water brought over by the super El Nino of 1998. In only three years It raised global temperature by a third of a degree Celsius and then stopped. A third of a degree is almost half of the 0.8 degrees attributed to the entire twentieth century and has observable consequences.This takes care of the warming but what is even more important are the no-warming periods. 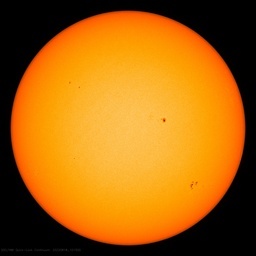 Right now these is more carbon dioxide in the air than ever before but there is no warming at all. And there has not been any warming for the last 15 years. As I have pointed out elsewhere there was also an 18 year no-warming period in the eighties and nineties that was cleverly covered up by a fake warming in official temperature curves. I discovered that doing research for my book “What Warming?” and put a warning about it in the preface of the book. Nothing happened for two years but then last fall GISTEMP, HadCRUT, and NCDC decided in unison to stop showing this fake warming. What they did was to secretly align their data for that period with satellites. It required cross-Atlantic cooperation and no explanation was given to anybody. If we now add these “liberated” 18 years to the 15 years of the current standstill we get thirty three completely greenhouse-free years. Knowing this, is it possible that there might still have been some greenhouse warming that happened more than 33 years ago? I think not. We have enough observations to conclude that greenhouse warming simply does not exist. And with it dies the last hope that AGW is real. “Both world wars and the 1930 depression”. I thought it was some kind of concensus among the warmists that the CO2 did not reach levels high enough to be affecting climate until the 50:s. It is strange if the lower production or whatever before then affects downwards, if it at the same time did not affect upwards. This paper is a positive event. It asserts that the science is NOT settled. It asserts there is a pause. It asserts that the IPCC GCMs do not explain the pause. And time series analysis does better than GCMs. Perhaps the time series analysis is simply picking the naturally occurring ENSO, AMO, PDO and other factors. They sound to me like they are not sure what is happening. To listen to them, they are part of the 3%! Cooling by CFCs may be largely confined to south of 50-60 degrees S. latitude – 6.7 to 11.7 % of the world’s surface. Meanwhile, warming by CFCs is global. Also, there is the Atlantic Multidecadal Oscillation, which affects north-south heat balance. It also affects global temperature, since the northern hemisphere north of 35 degrees N has greater surface albedo positive feedback than the southern hemisphere south of 35 degrees S. North-warming by AMO means global warming by AMO. AMO seems to have peaked around 2005-2006 or so. I expect the Arctic to have lag of a couple to a few years, in part from the strong local positive feedback causing recycling of effects through a mechanism that has lag. However, I would have expected the Antarctic to start warming within a few years after 2005-2006 … Maybe they are having a rut of cold weather, and I have seen lots of multiyear ruts in weather. Gary “If no one wants it, I guess we could call it the Pearse effect! It seems to name is not taken, but there is in psychology something called the “Pearse-Hall error learning effect”,which is probably quite appropriate for many people here. But where are the ozon proxies and the accompanying hockey schtick? Yearh, I want to know how this progressed too? The startling finding was put down to ‘impurities’. However, two years later there were still nagging questions about the rates. Has the variable ozone hole always existed? When the “pause” turns to cooling phase, and then rapid cooling, the alarmists will still blame the CO2 and humans for it, and demand “urgent action”, and “binding agreements” to give them power. As their “theory” is impossible to falsify, so is expecting them to admit that they were wrong is foolish. Everybody on the skeptic side of the climate wars takes aim at the very serious issues with the veracity of so much of the claimed and supposed science or should that be chicken entrails science, that appears from the alarmist advocates of catastrophic climate change. Nowhere have I seen an examination and an analysis of the funders or the distributors / allocators of that funding for this increasingly crap science and the funders / allocators motives in continuing to fund such disgraceful science. Continuing to fund such poor so called science will inevitably create a very severe backlash against science of every type and at every level amongst the prime sources of basic science funding, the tax paying man and woman in the street. And it already starting to happen if my anecdotal sources are on the ball with an increasing level of quite cynical comments on science, scientists and particularly climate science and they money they receive . The science, particularly climate science funders and allocators of the grants, ie the universities could fix the whole of climate science overnight by ensuring that any so called climate scientists and climate modellers and scientists of every discipline who have previously failed to produce papers of any relevance and / or failed to make ALL of their data, observations and computational methods free and open for all to check and see would automatically be cut from the funding stream. In other words take a very big axe to climate science in particular and force a drastic raising of quality of science research by simply refusing to fund rubbishy papers or those who cannot and do not produce papers of quality. Perhaps new papers and research should ONLY be paid for after acceptable science has been demonstrated to have been done to the required scientific standards. Yes. I know!. A lot of research would never get done and yet mankind’s greatest advances in the past have come from scientists who often had the minimal of resources and backing as in a salary only and not very good one at that. Good research once done and published would be well paid for and compensated in such a funding scheme. Bad research and bad or lazy researchers and gold digging academics would likely decide to find another occupation such as selling bridges in such a case. Of course if those same allocators of science grants fail to fix the mess that they have created and do so very soon, then the next stage is for the politicals, as they cop ever more flack from the tax paying public for allowing the zealots and bullies of a certain interpretation of science to dominate, bully and denigrate any alternative viewpoints, to cut back funding to those centers, the universities, that have so far controlled the flow of science grants to their insiders and fellow travellers or their running dogs in the old communist parlance, in climate alarmist science for many years past. And that WILL hurt and in the right spot for action to be taken and fast.. It would be a huge blow to the status, the standing, the reputation and the arrogance of academia in showing that they are far from being as untouchable as they have now come to arrogantly believe they are. In return, that contract from the tax paying public’s viewpoint is to support and allow reseachers and scientists and the universities the freedom to roam across the whole spectrum of human intelligence, knowledge and endeavor in a barely fettered quest to find and develop new knowledge and endeavours that will benefit us all. The tax paying citizen has more than fulfilled their role in generously, too generously in most cases, in funding science, more so climate science above all others . The scientists, the researchers and the universities and their steadily enlarging and already huge cabals of drone like academics have failed their part of the contract totally as they continue to skim off untold wealth through promoting and supporting what is clearly now being seen increasingly by the tax paying public as fraudulent science in many disciplines, climate science being the by far most obvious manifestation of this steady onset of the increasing corruption of long accepted basic academic and scientific principles. All apparently so as to gain further power and influence and wealth and try to ensure that the academic agendas of the social re-structuring of society can be accomplished to fit their own socialistic templates and aims. The BBC graphs are quite interesting. The upper graph shows a peak approx every 10 years except 1930 and 2010. The missing peak in 1930 is probably due to the Great Depression. The 2010 missing peak must, similarly, be due to the GFC. This implies that if we wish to prevent great heating we must engineer a few more GFCs. The lower graph has a vertical axis measured in units of 10 to the 22 years – rather a long time. This was apparently reached in about 2003 or 2004. But it has now fallen to close to zero times 10^22 years, and a few years ago was in negative territory, being -0.5 x 10^22 years. Does anyone know what this graph is about? I rather think that 10^22 years is rather longer than the currently accepted age of the universe. The two world wars where we smelted the metal and powered the factories for thousands of ships , tens of thousands of armoured vehicles and airframes and the engines to run them, millions of firearms and artillery pieces,Trillions of pieces of ammunition,Burnt all the gasoline and diesel to drive them around North Africa, the Atlantic, Europe and the Pacific. All that CO2 release caused a net cooling? Aerosols was it , well say it slowly in a Swedish accent……. Re the Antarctic Ozone hole and whether it is a normal long standing characteristic of the Antarctic polar region’s atmosphere. I really wish I had kept this comment which is the only such comment i have come across and did so a few years ago. It ran along the lines that pre-WW2 Japanese radio propagation researchers knew there was something unusual going on in the Antarctic atmosphere. Prior to WW2 the Imperial Japanese Navy [ IJN ] had been conducting very extensive mapping and radio communications research in preperation for what they anticipated would be a short sharp war in which the Americans after taking a beating would give up and sue for peace leaving the Japanese with most of their gains as an extended Empire. The Japanese Army wanted to go north into the then USSR but after the major defeat, a full on beating of the Japanese Manchurian Army by the Russians led by Zhukov in the 1939 Nomonhan Incident [ Jap ]- Khalkhin Gol [ Rus ] battles the IJN won the day and Japan went south. It seems that in their radio communication research for the anticipated wartime communications systems that the Japanese identified something quite unusual in the stratosphere high over the then almost unknown Antarctic continent and Southern Ocean regions which was quite probably what we know as the Ozone Hole. Particularly as the Ozone Hole extends on occasions as far north as New Zealand which was most definitely on the Japanese agenda as an area to be isolated so as to refuse the Americans the communications routes to the Australian continent and deny them another line of possible counter attack..
As a side line, the Japs had the best maps of Australia’s entire pre-war northern coastlines as they had been given the contract by the Australian governments of the time to map those same coastlines. And recently a gas pipeline was being laid across Darwin Harbour by a Japanese consortium for exporting natural gas when an unexploded bomb was found deep in the Harbour bed. The Japanese asked for an immediate bomb demolition team to remove that bomb and were told somewhat pointedly ; Remove it your bloody selves. It’s your bomb! And don’t mess it up or you will have half of Darwin gone. The language was more along the very blunt Australian way of speaking than i can post here. What on Earth is an Ecological Economist? But the old ones are OK? Uh-oh. I am reminded of a saying… “They are so full of [it] even their eyes are brown”. Of course that is why the name was changed from “Global Warming” to “Climate Change”. That way the Warmists have all the bases covered. It is also an admission it is a HOAX and they darn well know it. Washington DC, a couple hundred miles north, is forecast to have temps of 30°F-32°F (at or just below freezing) with rain also forecast…. Why do we get the colder temperatures and SNOW darnit? Time make sure all the stock tanks are full and turn off the pasture water, drain hoses…. More likely an active sun both reduces total stratospheric ozone and cools the stratosphere whilst a less active sun does the opposite. Note the change in trend from falling to flat (and possibly now warming) in stratosphere temperatures around 2000 when the sun became less active. There were lots of other changes in climate trends around the same time to which I drew attention in previous threads here and elsewhere. Who pays for; the Free University in Amsterdam? Neo-coms everywhere don’t seem to understand that there is no free lunch, or Universities. Ozone is diamagnetic (repelled by a magnet), O2 is strongly paramagnetic (attracted by a magnet) so ozone is pushed away from the pole and O2 is attracted so there will always be an ozone hole. Note the “collar” of elevated ozone around the hole, like a roll neck sweater. While Ozone and O2 exhibit various (para or dia) magnetic properties, there can be other, over-powering factors (like winds and movement of air-masses by high and low pressure systems et al) which preclude the ‘precipitating’ of O2 at the poles and Ozone at the equator … nonetheless, an interesting perspective. I agree, CFCs were not and are not the cause of any “Ozone depletion” in the atmosphere over Antarctica. Besides, the touted “fear” that the Ozone Hole would permit more UV through to the surface thus causing skin cancers would have been “self-correcting”. It is the UV radiation that creates the Ozone. I personally believe that CFCs were banned for a “purpose” but that purpose was not to “save the Ozone”. Said “save the Ozone” was little more than fear mongering to convince the public to quit buying and/or using all of the hundreds of different “aerosol spray cans” …. in which was the Freon that DuPont was producing. Like the “Tuna Fish scare” when someone first tried to sell white albacore tuna the public wouldn’t buy it because it wasn’t the pink tuna they were use to. After months of really poor sales the manufacturer changed the label on the can to read “GUARANTEED NOT TO TURN PINK IN CAN”. Sales of white albacore tuna immediately skyrocketed. They are “just trying to understand” and yet still 95% certain we’re responsible. Anybody else find a logic error in this? The OED defines ecology as “The science of the economy of animals and plants”, so one might suppose that an ecological economist is someone who studies the economy of the economy of animals and plants. Presumably an Ecological Economist would be work in the Department of Redundancy Department. I would suggest that Francisco Estrada’s redundantly redundant redundancy needs more redundancy in order for him to be more redundantly redundant. Or sumfink! It’s not confusing at all. CFCs warm some latitudes and cool others. (Sort of like that hotspot, that sometimes goes to AUS and the cold spot over North Europe and Asia.) Removal of CFCs cause the backlog of snow to be released (it needs to go SOMEWHERE, obviously!). Hence it buckets down on Rus and UK, as well as the Antarctic – now defined to include the whole ocean up to NZ. Meanwhile, by adding 70 knots to observations, storms are the worst ever. AUS had a fire. PH had a typhoon. I’m shivering uncontrollable in Sydney in Nov (while sitting under a heater!). It’s Climate Weirding, people! And it’s been caused by the PM announcing a repeal of the carbon tax next year. If you don’t believe me, just read about it in the next Lewandowski paper. I did some work at IBM in cleanrooms in the early 1980’s and I recall filters were use removed ozone, I recall how ozone had a smell too it too. So I read up about it. I also recall the scare of the ozone hole making headlines in the MSM in the UK in the mid-1980’s. Not only did I know ozone is diamagnetic, the claim back then was CFC’s released in the northern hemisphere were, as if by magic, accumulating over the southern pole, creating the hole. I had a good laugh about that then. Seems its time to laugh again about crazy claims about holes, ozone and climate change. The Estrada paper is meaningless because it ignores the contribution from HFCs which are the major replacement for CFCs, and are similarly potent greenhouse gases.